The Binding of Isaac: Rebirth begins as a reference to the Bible passage about the sacrifice of Isaac, in which the character Isaac is based. But as you venture in the basement of Isaac, you can unlock several other characters based on biblical figures. Check out how to unlock them all. Each character has its own values on three attributes: Hearts, Speed and Attack. Isaac for example, starts the game with 3 hearts with speed 2 and 2 causing damage. This means that you can choose another character that suits best to your way of playing. It can be tougher but slower or cause more damage while having less hearts. To unlock Magdalene just that in a game with any character you accumulate at least 7 red hearts. She has 4 Hearts, 1 Speed, Attack 2, is known as a "tank", as it moves slowly and is more resistant. It also boasts the Yum Heart item, which allows it to retrieve a heart energy. It is not difficult to unlock Cain, just that you accumulate 55 coins in a single match. He has 2 hearts, 2 speed and 2 damage, it is practically Isaac with less energy. The advantage is that it starts with a key and the item Lucky Foot, which increases their lot, to the point you win more prizes on the machines of games and never take pills with negative effects. This is a little more difficult because for that you need to overcome Satan, the final boss of Sheol, at least once. Judas has only 1 Heart, 2 speed, but because 3 damage. He accompanies the item The Book of Belial that adds 2 more damage when used in addition to increasing the chance of appearing rooms to make pacts. A mysterious character who looks like a blue version of Isaac with stitched eyes, ??? Baby Blue won the nickname among fans. It can be unlocked by defeating the boss Mom's Heart 10 times. It has 2 speeds and 2 cause damage, but does not have normal hearts. His energy is composed of 3 Soul Heart, special blue hearts. A curiosity is that ??? not appear on the character selection screen to be unlocked. Unlock Eve is easy, but it can slow you down in a match. Just across two floors without taking any heart and it will be released. She has 2 hearts, 2 speed and only 1 damage. She has the items Dead Bird, attacking enemies after you get hit, and Whore of Babylon, which increases the attack power of your character when you have only half a heart energy. Like Eve's unlock method, you need to pass two floors without taking any damage, which can be quite difficult, especially in the heads. He has 3 hearts, 2 speed and starts causing 1 damage. Where Samson is reached, he gains a bonus on your attack power, getting stronger. The demon Azazel is easy to unlock, just do three pacts in a single match. It has 2 speeds and 3 attacks, but its hearts are special 3 Black Hearts. Azazel has amazing abilities, like flying through obstacles and firing a shot lightning-shaped and powerful, whose only drawback is the short range. It also features the Tarot card The Fool, which lets you teleport to the top of a floor. To release Lazarus just that you get 4 Soul Hearts, Special blue hearts in a single match. It is basically Isaac on attributes, with 3 hearts, 2 speeds and 2 attacks. But he has a second life and resurrect leaves a trail of blood that causes damage to enemies. Lazarus also has a random pill when you start a game. Of all the characters, Eden is the only one not is permanently released. Every time you defeat Mom's Heart, you get a "Eden Token" that plays the game at Eden once. 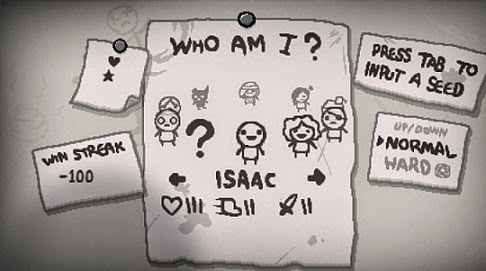 Eden attributes are randomly generated, although they have a certain limit, and the items he will start the game are also a surprise. The most difficult character to unlock, The Lost requires that you have already unlocked before Magdalene, Judas and Azazel. First, start a game with any character and get the items or Missing Poster Mysterious Paper. In possession of one of these items, die in a sacrifice area, these empty rooms that have only thorns in the middle. Now begins the chain of events that can not be stopped or will not function. Start a game with Isaac and die for a Mulliboom in Basement or Cellar. Now in another round use Magdalene and mate with their own bombs in Caves or Catacombs. In a new departure with Judas, die to the foot of Isaac's mother in the battle against Mom. Finally, play a game with Azazel and die for the second form of Satan. The Lost does not have hearts and has 2 speed and attack. Its biggest advantage however is that it can acquire all the items completely free pact rooms and can become quite powerful.